Five individuals and five teams of high school students have been selected to compete Friday and Saturday (Nov. 13 and 14) at the University of Notre Dame in the regional round of the Siemens Competition in Math, Science and Technology, the nation’s premier science research competition for high school students. The New Jersey-based non-profit Siemens Foundation created the competition to enhance science and mathematics education in America. It is open to individuals and teams of high school students who develop independent research projects in the physical or biological sciences or mathematics. Competitions in six regions across the United States are being held throughout November. Regional scholarship winners advance to the national competition Dec. 3 to 7 in New York City for a top individual prize of $100,000. Members of the top winning team will share a $100,000 scholarship. The Siemens Foundation has partnered with six of America’s leading research universities to assist in judging and hosting the regional competitions throughout the fall: the Massachusetts Institute of Technology and the Georgia Institute of Technology (Nov. 6 and 7), the University of Texas and Notre Dame (Nov. 13 and 14), and the California Institute of Technology and Carnegie Mellon University (Nov. 20 and 21). The public can view student posters at 5:30 p.m. Friday (Nov. 13) in the study lounge of the Jordan Hall of Science. The competition keynote address will be delivered by Carolyn Porco, a planetary scientist and the leader of the imaging science team on the Cassini mission presently in orbit around Saturn. In late 1999, she was selected by the London Sunday Times as one of 18 scientific leaders of the 21st century. She is director of the Cassini Imaging Central Laboratory for Operations (CICLOPS) within the Space Science Institute. CICLOPS is the center of operations for the imaging experiment on Cassini and the place where images are processed for release to the public. Porco’s address, which is free and open to the public, will take place at 8 p.m. Saturday (Nov. 14) in the Sargento Auditorium of the Jordan Hall of Science. A new feature of this year’s Notre Dame regional Siemens competition is an outreach workshop for students from five South Bend area schools on Friday afternoon (Nov. 13). Students from LaSalle Intermediate Academy, Trinity School, St. Joseph’s High School, Marian High School and Adams High School will receive a briefing on scientific research at the Jordan Hall of Science after the school day before attending the competition’s poster session. The Notre Dame individual finalists are: Angela Ma, Carmel High School, Carmel, Ind. ; Arjun Puranik, William Fremd High School, Palatine, Ill.; Marissa Suchyta, University of Chicago Laboratory School, Chicago; Dennis Tseng, William Mason High School, Mason, Ohio; and Kevin Wang, Wylie E. Groves High School, Beverly Hills, Mich. The Notre Dame team finalists are: Qingyuan Chen, University of Chicago Laboratory School, Chicago, and Fred Schmitt, Naperville Central High School, Naperville, Ill.; Randy Jia and David Lu, Detroit Country Day School, Beverly Hills, Mich.; Renjay Lui and Bingjie Qui, Troy High School, Troy, Mich., and Lucille Zhang, Detroit Country Day School, Beverly Hills, Mich.; QinQin Yu and Sarah Kang, Rock Bridge High School, Columbia, Mo. ; and David Zheng and Michael Luo, Carmel High School, Carmel, Ind. 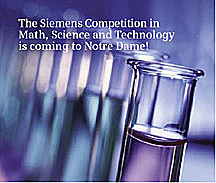 The Siemens Competition in Math, Science and Technology is a program of the Siemens Foundation, a national leader in math and science education. The competition is administered by the College Board. Originally published by William G. Gilroy at news.nd.edu on November 09, 2009.